If you are not already using creatine as part of your nutrition regime then you are missing out. Creatine is one of the most popular supplements in the world and one that is supported by an absolutely enormous amount of scientific and medical research. Creatine has been shown to enhance lean muscle mass gains, improve strength, support faster recovery and help prevent injury from exercise. 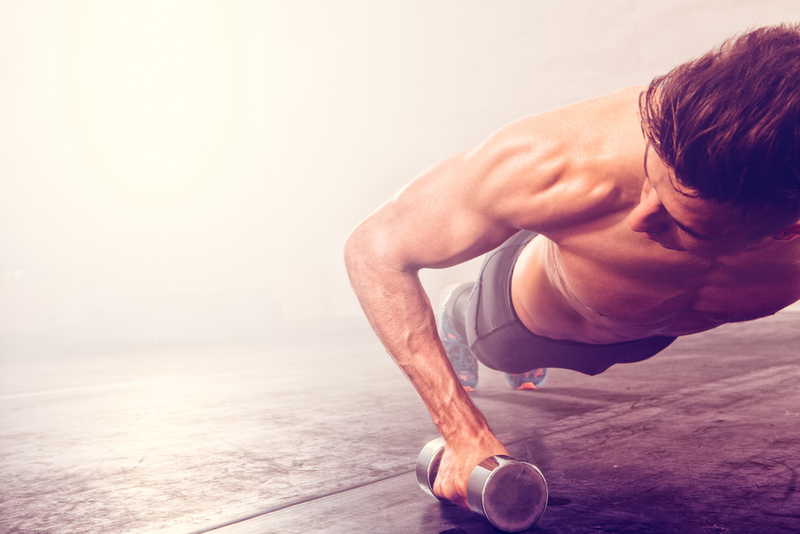 Some forms of creatine have been shown to improve cognitive performance. Even better, numerous studies have concluded that creatine is one of the safest supplements you can take. This is supported by, among others, Healthline and The Mayo Clinic. Alternatively, perhaps you are already wise to the benefits of creatine but not getting quite the results you want? Maybe you are looking for a more effective supplement? Of the few variations of creatine available, creatine monohydrate is the most effective at supporting muscle and strength gains. HONOURABLE MENTION – My Protein Creatine Monohydrate. 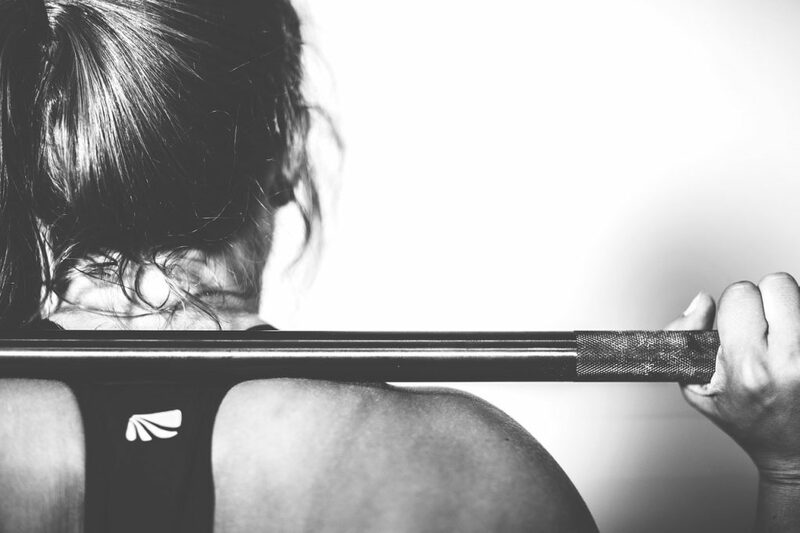 When your muscles engage in activity, particularly the kind of explosive activity you’ll be demanding of them during your training sessions, they get their energy from Adenosine Triphosphate, or ATP. This molecule is broken down in to ADP (Adenosine Diphosphate) to release energy for your muscles to use. Creatine is the thing that converts ADP back in to ATP and can help to increase the amount of work you can do while training, leading to bigger gains and faster recovery over extended periods of time. It exists naturally in your body and the majority of it is stored in your muscles in the form of phosphocreatine and can be ingested through meats including beef, pork and some fish. It is also one of the most popular and well-researched supplements out there, for good reason. Where to start? The list of benefits that have been attributed to creatine is long and includes; increased muscle strength with one study noting significant effects in as little as two weeks of supplementation as well as increased overall lean muscle mass. The science also tends to support creatine’s ability to provide quicker recovery from training, higher levels of endurance and mitigation of age-related muscle loss. Creatine has also been used as a nootropic and there is some evidence pointing to cognitive benefit from creatine ethyl ester. Athletes of any discipline who are looking to increase their overall performance potential can and do use creatine to support their training goals. It is one of the most popular supplements on the market, due in no small part to its low cost and relative accessibility, and is a worthy addition to your supplement regime regardless of your level of ability. Whilst creatine can have equal benefit regardless of your age, as this study using young football players shows, some experts do warn against using it if you are under the age of 18 as the long term effects on bodies that are still growing are not yet fully understood. The most common form is creatine monohydrate but other available forms of creatine include creatine ethyl ester and liquid creatine, both of which are commonly believed to be less stable and harder for your body to absorb. 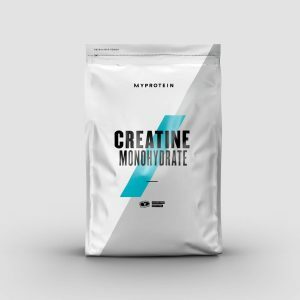 Variants of creatine monohydrate are available, including micronized creatine, which results in a finer powder that is easier to mix and supposedly therefore easier to absorb. There is also tri-creatine malate which is supposedly easier to absorb, but we recommend you stick to good old fashioned creatine monohydrate as this is the most tried and tested form. You’ll find the majority of products are presented in powder form although creatine is available as a pill. Sticking to powder offers two major advantages, firstly it’s almost always cheaper per kg to buy powder, and secondly it is much quicker to absorb than a pill or tablet. We’ve covered a lot of positive side-effects to supplementing your creatine intake, but what about the negative side-effects? There is some circumstantial evidence to suggest certain forms of creatine can cause gastric discomfort such as stomach pain, diarrhoea and nausea. Creatine also draws water to the muscles, so be sure to drink plenty of water to avoid dehydration. The International Society of Sports Nutrition, however, considers creatine to be extremely safe, though you should always seek the advice of a medical professional if you are in any doubt. The Mayo Clinic cites two groups of people who might want to swerve creatine altogether, those with kidney problems and those with bipolar disorder. Otherwise, it is generally considered safe to use. Assuming you go with a powdered creatine supplement, you should mix the recommended dose in a liquid in order to drink it. Which liquid you choose to use is up to you, though some believe that to get maximum benefit, you should mix it with fruit juice so your body gets a nice sugar hit to coincide with, and support, the creatine being absorbed. Others advocate mixing it in with your protein powder and taking it after or during your workout. Loading vs Cycling. Pre- or Post-Workout? There are two approaches you can take when you first take creatine. The first involves a loading period of between five and seven days initially during which you will ingest around 20g per day and then drop down to a regular 5g per day serving. The second approach starts off at the regular 5g per day without the loading period, but requires you to cycle off it every so often. Generally, the first approach is recommended and shown to support higher overall levels of creatine in your body. There is conflicting evidence and beliefs around when is the optimum time to take creatine – before your workout, just after, when you wake up or just before you go to sleep. Normal practice would be to either take it as part of your pre-workout or post-workout nutrition, but many personal trainers will tell you the post-workout is more effective. That’s because creatine works better when loaded, which often isn’t an option with pre-workout supplements. Unsurprisingly perhaps, the one thing we advise above all else if you are looking for a creatine product, is to go with the proven powdered form of creatine monohydrate. 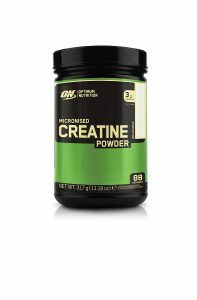 Our pick for the best creatine supplement you can buy in 2019 is Optimum Nutrition’s Micronized Creatine Powder. Firstly, it’s a Creapure product which should be enough to instantly place it towards the top of most people’s list. Creapure is the highest quality creatine powder out there at 99.9% purity. What Optimised Nutrition has done is to take the best and make it just a little bit better by creating a fast absorbing and fast acting compound without watering down Creapure’s magic formula in the slightest. Although the serving size is a bit smaller than other creatine supplements at 3.6g per serving, this is still within the 3-5g per day range that science suggests is the optimum level to support muscle building and recovery. You always have the option of being a bit generous with the scoop if you feel like 5g a day is the right level for you. Feedback from users indicates that Optimum Nutrition Micronized Creatine Powder produces results incredibly quickly. This is likely due to the quality and purity of the creatine it contains. Plus, the fact that Optimum Nutrition recommends a standard loading phase of five days during which you take four servings per day to saturate your muscles with creatine before moving down to one serving per day to maintain these increased levels. All in all, there is very little to be said against this product; it is the best all round creatine monohydrate powder out there. Probably why it is also Amazon UK’s top-selling creatine supplement. 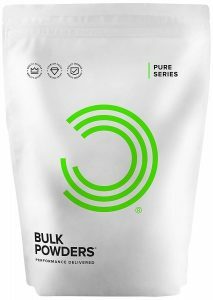 A close second, this stalwart offering from Bulk Powders gives you outstanding value with very little compromise needed in return. This creatine powder may not contain Creapure but the level of purity you get here is very close and it is almost as silky and quick to absorb as other brands containing Creapure. There are a couple of different flavour options you can choose from if you like your creatine with water, Apple & Lime or Mixed Berry. Users report the flavours are tasty, but we question their usefulness slightly as most gym-goers who use creatine often find it more convenient to throw the powder in with their usual pre- or post-workout shake and for this, you’ll want the unflavoured powder. Bulk Powders Creatine Monohydrate does serve up a full 5g of creatine in each helping and this, combined with the speed at which your muscles will take in and be able to use this creatine, means that a loading phase is not necessarily required so that value stretches even further. This is the perfect creatine supplement if you’re bodybuilding on a budget or you simply can’t resist a bargain. It loses out on the top spot not so much due to it not containing the Creapure formula, but more because a few reports state that the powder is sometimes lumpy and difficult to dissolve, despite the reseal-able packaging. Bulk Powders Creatine Monohydrate takes the third most popular spot on Amazon UK’s best-selling creatine supplements list (the second best-selling brand after Optimum Nutrition), meaning it’s a tried, tested and proven success. 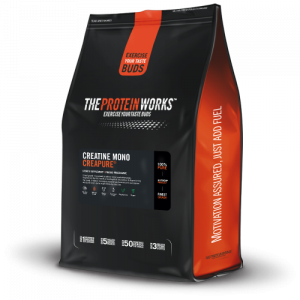 Third spot goes to The Protein Works Creapure Creatine Monohydrate. Obviously, being a Creapure product, you get the gold standard in purity and overall quality, but The Protein Works has added to that and we were very impressed with its interpretation of one of the most popular sports nutrition supplements in the world. This is a micronized ‘200 mesh’ form of creatine. The tiny particles may not always mix perfectly with liquid, but they are digested and absorbed incredibly fast once they reach your stomach. This means that if you prefer to take your creatine as part of your pre-workout nutrition, you get maximum benefit out of it. There are a couple of flavoured options if you are so inclined, but more often than not it is easier and cheaper to stick to the standard unflavoured powder so you can mix it with whatever you like without worrying about the orange crush clashing with your vanilla pre-workout shake! What we also liked about The Protein Works Creapure Creatine Monohydrate is the price tag; it is one of the best value supplements out there that contains Creapure. Like most of the entries on this list, you get 5g per daily serving of extremely high-quality creatine, and for a very reasonable cost indeed. Number 4 on this list is PhD Nutrition Creatine Monohydrate. 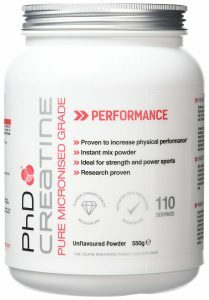 Similar to Bulk Powders, this does not contain Creapure creatine, but is PhD’s own formulation that comes close in terms of potency and quality. What is does offer in addition to quality is value. Even if you pay full price via the manufacturer’s website, you still get a great deal on this highly effective supplement. The only flavour on offer is ‘unflavoured’ which is fine since you can add it to juice or your normal pre- or post-workout shake easily. The ingredients are 100% creatine monohydrate and PhD dish up 5g of this per serving. This is a micronized creatine powder so should mix very easily but the feedback is hit and miss on whether this is actually the case. A good tip is to mix it with liquid at room temperature which will dissolve the powder faster than cold water or juice. Thanks to the healthy serving size and high purity of this supplement, you don’t necessarily need to do the standard loading phase if you want to make your supply go that little bit further. This is another outstanding option for price-sensitive gym bunnies with the daily cost coming out at less than 10p. One thing to note with PhD Nutrition Creatine Monohydrate is that the packaging states that it is suitable for vegetarians but, unlike most other entries in our list, not for vegans. Just sneaking in to our top 5 is LA Muscle Explosive Creatine. LA Muscle have positioned themselves very much at the premium end of the supplement market and their products carry a premium price tag, but if you want the absolute best, their products are a worthwhile investment. If you have ever wondered how creatine, one of the most widely researched and proven supplements available, can be improved, then LA Muscle Explosive Creatine is the answer. As well as providing 5g of super micronized creatine monohydrate per serving, LA Muscle have added Dextrose to ensure the creatine is absorbed as quickly as possible. They also include a small amount of Taurine and L-Arginine Alpha Ketogluterate (or AAKG) which has been linked to increased vasodilation during exercise. Both of these can contribute to higher energy levels during training and a more intense pump. They also throw in some Sodium and Potassium Phosphates for good measure; these are there to support the uptake of creatine in your muscles. 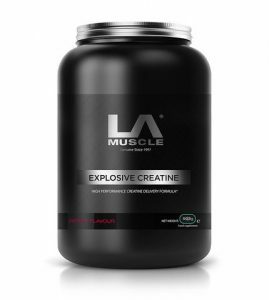 If you are looking for something that will not just give you a little extra energy in the gym, but something that could supercharge your training and help you hit a whole new level, then LA Muscle Explosive Creatine is well worth trying, but fair warning, it really is premium in every sense of the word, including cost. 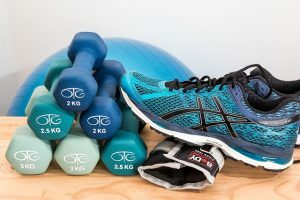 If you are still finding your feet with your workout and nutrition programme, then you are well advised to stick to one of the other products on this list for the time being. We must give a brief shout out to My Protein – it’s very difficult to argue with the value that it offers, and its creatine monohydrate powder is one of the cheapest you’ll find. In addition to the powdered creatine, it also offers tablet form, which some find more convenient to take. It also has a Creapure-based powder that is as competitively priced as its other products. The recommended serving sizes are towards the small end of the spectrum, but you can increase the serving size yourself to 5g per day and still end up spending about £4 per month! My Protein narrowly missed out on making our top 5 because, whilst the products do offer incredible value, their effectiveness was not rated quite as highly by users as the supplements listed above. That said, if you’re a My Protein fan it’s likely you’ll just go ahead and order their creatine anyway and there’s nothing at all wrong with that. They are solid all-round supplements. Ben is an experienced freelance writer and blogger, writing for a range of industries including leisure, technology and health. He also has significant experience in sales and marketing. When he’s not writing, Ben is an avid reader, health and fitness enthusiast and father to three young boys and two dogs. Ben has been working out and using supplements on and off for around 15 years. Most of his efforts in the gym these days are focused around keeping up with his three young sons. While they’re still quite young, they’re not getting any smaller and his pride can’t take a loss, even if it is to three primary school kids! What interests Ben most about exercise and supplements is efficiency -- how he can get the most bang for his buck and the best use out of his time in the gym. Because of this, he takes a scientific approach to reviewing supplements and always looks for what is going to produce the best and most reliable results.